SHANE PRIGMORE: CORALINE IS IN THEATRES NOW!!!!! 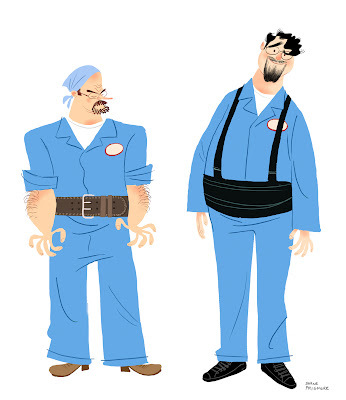 Between all you guys' blog posts, we'll all have the digital "Art of" book they should've made! More, please. You kill me. These are amazing. Like I said on Shannon's blog, this movie just amazing, visually stunning and just so much fun to watch, great designs, great everything!. Amazing work! The film looks incredible! Beautiful work for a beautiful film! What a privilage it must have been to work on such a cool project. Great job my friend!!! cool designs! Very true to the spirit of the book. Nice job! Loved the movie, and was impressed by your talk at Nucleus. Awesome work! I was at the panel yesterday (I said hi to you at the break and kind of exploded) and I was wondering if there would be any chance of the art being seen again. I absolutely loved Coraline. It was not only an outstanding achievement, but it was quite inspiring - I've been rethinking my film ever since Friday thanks to it. I just stumbled onto your blog while geekishly looking to learn as much as possible about this film. It's one of the most beautiful films I've ever seen, the animation is just stunning. I can't imagine seeing a better picture this year. Thanks for your work. Awesome presentation, Shane. All of you guys did such a great job! There comes a time when something like your presentation serves as a refreshing glass of re-inspiration! Thanks ever so much! INspiring designs Mr. Prigmore. The film was AMAZING. Saw it last night! Amazing man!! Hey, love those Coraline Mystery Boxes that were sent around.... check it out. Yeah I was at the panel, it was great dude. The artwork you guys did for the movie is rediculous, so good. I saw Coraline that night, and was really impressed with how well they translated all that work into the puppets and sets. Yeah the shorts almost done, I'm real excited for people to see it. I'll stop by next time I'm at Dworks. Sooo good! Paticularly the color and lighting in the ghost children image. I missed out on your amazing panel on Saturday due to prior plans, but luckily I convinced a friend at the last minute to tape it for me. Really looking forward to hearing about all the design theory that went into the look of this movie. Kudos to both yourself and the rest of the crew on making such a great film. Wow Coraline is a landmark film in stop motion animation! Congrats on an amazing film! glad to find your blog! amazing stuff. can't say enough. THank you everyone , and thank you from the entire crew of Coraline. We are so glad you guys like what you saw. I have been waiting to hear responses about the film forever, because it is so unlike any other animated film ever made. Its not realy a comedy, its not a musical...Its its own Fairytale language. To quote Tony Stockey (a director in the feild) "Its the first independant film for kids." But thank you for the kind words and the excitement everyone and I am extatic that anyone responded to our work. I saw the Coraline exhibit at the Cartoon Art Museum in San Francisco yesterday and I immediately made note of your name. I am so happy to see more of your work online:) Your art for the movie was stunning and the film was exquisite and refreshingly unique. I am looking forward to seeing more of your work! im just messing with you man. just giving you a hard time. but thanks for the post. but really i was JK. The movie was fantastic! You guys did a really great job! Shane you make it look easy, thanks again for sharing. All of your guys' posts more than make up for the art book. 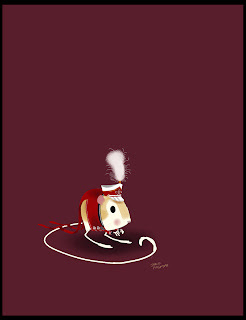 shane i didn't know you designed the jumping mice! BTW, We miss you and Shannon. You guys should come up and visit. We'll go grab a drink at the Blue Moon or Lompoc. I can't believe they didn't put most of the artworks in the "artbook". like the stuff Chris Applehan and you did. 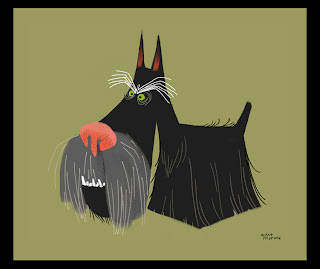 I love those little scotty dogs. Something about their teeth makes me laugh lots and lots. Congratulations to you and everyone else at LAIKA, sir! I've only done a little freelancing at laika/house, but it's a great place that deserves great things to come. This is so cool that people are excited about the film in any way! thank you everyone! KACEY: THat is very cool. I'm glad you liked any of my work. I'm planning on going to that exhibit soon! ED: Yah I designed those little bastards. We miss you too man. We should plan a trip to come up and visit. BRIGETTE: I was so happy when Kent Melton sculpted those teeth into the final puppets. Scottie dog teeth are gross and weird. They were hilighted nicely in the scottie's first appearance at the door window. I was crying laughing. AMY: I hope Laika continues to make amazing , unconventional, risk taking films! Oh man- you're spoiling us with this gorgeous stuff! Beautiful tribute to Mr Ranft too. Awesome! Thanks for doing the panel and for showing so much of your beautiful artwork, I hope you post more. 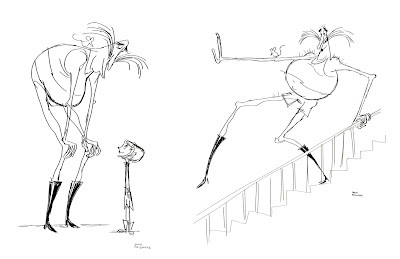 thanks so much sharing these incredible sketches for this awesome film! congrats too - it was a complete success! definitely one for the home library! Congrats, the movie is AMAZING. As is all this concept work. Thanks for sharing. I'm watching your Gallery Nucleus talk now. 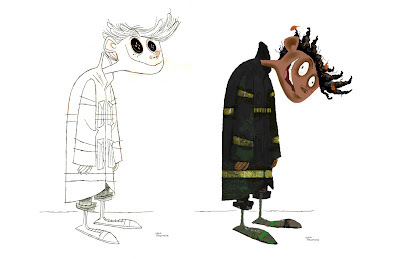 Awesome designs Shane, I especially love the designs you did of Coraline, great job on this movie. I saw Coraline opening night last week. AMAZING FILM!!! I love your characters and you contributed some amazing ideas and designs! Great work! Fantastic job Shane and Laika crew! Coraline was terrifying fun! 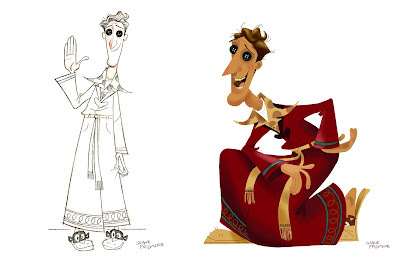 ..its great to see the original concepts for such a beautiful film. Great stuff Shane, love that dog! hey dude Great great Work on Coraline. listen ive been trying to reach ya, thru Ward jenkins, i i aint got your email, drop me a line to my blog or email. Yup, I did see the movie, it was epic. Awesome designs, I was wondering if you also did April and Miriam's theatre posters as well? I would lvoe to see those, including the designs oftheir younger selves again in their lingerie like acrobatic costumes. And I have loved the art from day one - and thought you should know that everyone I've talked to (whether animation student or not) have loved this movie. I can't get over that beautiful animation. Sigh! Absolutely beautiful designs Shane, I love the terrier all the characters are superb, I am really looking forward to seeing the film. Wow, thanks for posting up the pics dude. Some amazing work here, can't wait til it comes out here in NZ! There's not even a release date here... poos! oh yay!! these are fantastic! SO AWESOME!!!! AND CORALINE ROCKED!! Hello! 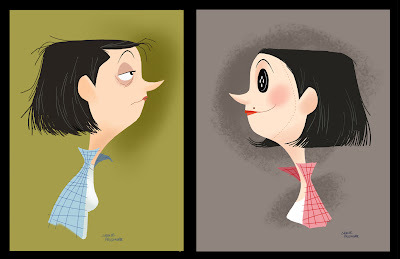 First I just want to say your work is amazing, as is all of Coraline! Utterly incredible. I myself am an aspiring stop motion animator (I am still in college, but am lucky enough to have gotten jobs from bands to do animations) and as such, seeing Coraline was the greatest thing ever. I was left speechless by it the first time I saw it. I was so excited I was babbling and my fingers kept shaking about as if all my excess energy was trying to flap away. I must have looked a nut! Now, as much as I hate to ask through a personal site or such, but what's the best way to get noticed by Laika or such? Will it be possible to get jobs there in the upcoming years? I know that relies on more animations happening...I just want to be there for sure...I have been doing stop motion since I was a kid and obsessively watched Harryhausen and Svankmajer, and well, I haven't changed! It'd be great for an actual animator to watch and see what's what, so to say. Again, great job on Coraline and sorry for such a long and semi-self promoting post. I just can't help myself! Man, this is a masterpiece! I wrote a couple thoughts on it, if you're interested. Going to see it again tomorrow - woohoo! love your work! i am very inspired by your character design. thank you for sharing! Awesome style!! Really a great work. Wow, the whole project is just amazing. Sure you had a blast working on it. I love how you combine the mid-century illustration style with CGI, really powerful result. congratulations on all the work, can't wait to get to the theater to see Coraline!! Thanks for the info! I do have a question. I often talk to my students (juniors and seniors in high school) about all of the hard work that goes into any commercial art type of endeavor...A lot of times students have it in their mind that they sit down and the first thing that shows up on paper is the greatest and miss out on all of the refinement involved in getting the 'final' look of the character. What are the odds I could bribe you into picking on character and showing the stages from thumbnails/roughs through to the finished work that got the stamp of approval...I mean it would be awesome if you would do it for all of them but I would settle for just one!!! hot damn, shane! these are magnficient, as is the entire film, Coraline. brilliant all-around due in no small part to your impressive illustrations and design-work. Shane Prigmore, I watched Coraline today in 3D. Fantastic! Great job! that was a great movie and those are some awesome designs!!! Love the style! Fantastic job; I loved that the movie was 3D without being "in your face"; feeling like I was part of the environment was an added bonus. The characters and the set design were flawless. Wow—I think I enjoyed it even more than Nightmare Before Xmas. Can't wait to see the movie here in Italy. Congratulations on Coraline. I loved it!!!! Got the glasses framed in a gold case ha ha ha ha ha. Just joshing but great job non the less!!!! Well, I only saw it twice... SO FAR, but it's an AMAZING film!! Congratulations on this tremendous achievement! 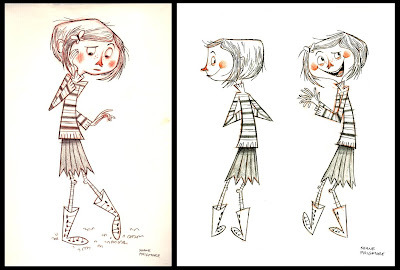 Now I need to step up my game so one day I'll be lucky enough to do what you do on a wonderful film such as Coraline. Shane, yesterday I saw Caroline in the teather, I love it, I falling in love with the designs, I think the script its look like Alice in the wonderfull land. Amazing! 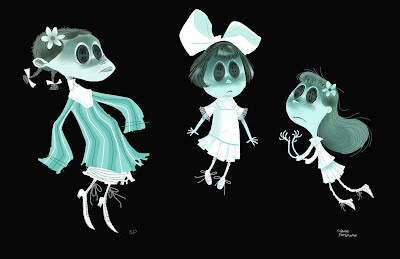 I have seen Coraline twice and am blown away by the art, but mostly the character designs--wow. 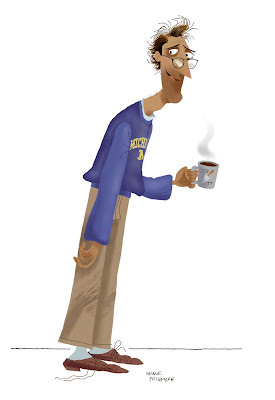 I think the two designs that stood out most to me was the dad, the way he stood with his long neck, and the scotty dogs. But it all was great eye candy! i can't say much how fantastic your work is and how lucky you've been to work on the film, congratulation ! it is brillant, brillant, brillant!!!! i didn't know you work on that? ...just kidding! Beautiful work for a beautiful film! What a privilage it must have been to work on such a cool project. Thanks for sharing nice information with us. i like your post and all you share with us is uptodate and quite informative, i would like to bookmark the page so i can come here again to read you, as you have done a wonderful job. I found your blog using msn. Amazing article to read, thanks for sharing. thanks for the valuable info u provided.